Here’s a multi-purpose, low-maintenance, easy-to-grow, Zone 4 shade groundcover that while not prevalent at nurseries is well worth seeking out. I first started growing Canadian ginger ten years ago, and from the two or three small divisions I spotted at a farmer’s market I now have drifts, swatches and clumps settled throughout most of my property. The plant is not by any means a showstopper; in fact, spring flower is nearly colorless, odd, and ugly, gratefully hidden underneath large, heart-shaped leaves. Use Canadian ginger as the set-up, the transition in the shade garden, the matte of the painting. It tends to perform aesthetic chores humbly, setting off the plants around it. Leaves are large, up to eight inches across, and completely block out any weed growth underneath. The plant spreads moderately year to year, its fleshy root system visible just above ground. Worth a try in Zone 3, with winter protection. The plant is not really a member of the culinary ginger family (Zingiber officinale) but obtained its common name due to the fact that its roots smell like ginger, and in fact were used as a ginger substitute by early Canadian and American settlers. 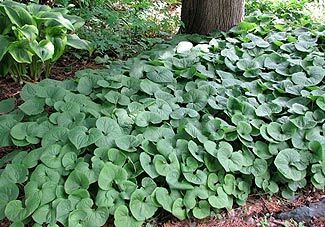 Plunk Canadian ginger anywhere you’re getting sick of hostas; it works particularly well underneath trees and throughout shaded woods. I like to string it along in curving banks. You can divide it with a shovel in the spring, just slicing through and digging out clumps to replant elsewhere. I’ve never fertilized it in my life. It has no pest or disease problems to speak of. It prefers soil that has a fair organic content, although once established I’ve found it wanders off into any old soil it finds along the way. Though the books say it does best in moist woodland soils I have older patches of this stuff in some areas that I absolutely never water, and each spring, there it is, greater in girth than the year before. Granted, these are very shady places. It will do fine if exposed to several hours of direct sunlight, but in these instances one should not let the soil dry out indefinitely. I have no idea the name of the cultivar I bought — it was simply labeled “Canadian Wild Ginger” — but you may encounter varieties named ‘Eco Choice’ and ‘Eco Red Giant.’ Toss some in a shady corner and forget about it. A few years from now you’ll think of many places to try it.